The Mobile App Trends Series is sponsored by Sourcebits, a leading product developer for mobile platforms. Sourcebits offers design and development services for iOS, Android, Mobile and Web platforms. Follow Sourcebits on Twitter for recent news and updates. We’re going to take a look at how some of the best HTML5-centric, cross-platform mobile frameworks are being used to help developers deliver native app experiences on a variety of devices. This is particularly true for mobile devices. A de facto requirement for any modern mobile operating system is the inclusion of a modern HTML5-compliant web browser. The leading modern mobile platforms — iOS and Android — both use WebKit as their bases. Likewise, BlackBerry and HP/Palm are also using WebKit and Microsoft is going to release a mobile version of Internet Explorer 9 for Windows Phone 7. What this means is that out of the box, modern smartphones and tablets support the bells and whistles that make HTML5 so special. It also means that developers can feel free to use those technologies when creating their applications and not have to worry that the device itself won’t support a particular function. It also means that developers that choose to create HTML5 web apps for the desktop — like for the Google Chrome Web Store — can often use the same code when crafting an app for the iPad or for other tablets. Earlier this month, leading iOS developer ScrollMotion released its first simultaneous e-book for the iPad and Chrome Web Store. Because ScrollMotion has built its underlying app platform in HTML5, porting the content to a non-iOS device, like the Chrome browser, required very little work. Choosing what mobile platforms to support continues to be a vexing problem for developers both big and small. Supporting one platform can be difficult enough, but now developers not only have multiple operating systems to consider, but multiple device types as well. 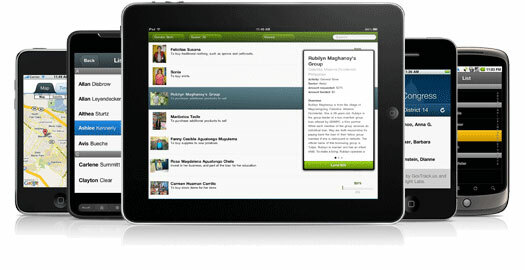 iPhone and iPad apps can be packaged together, but both require separate experiences and views. Likewise, Android developers that want to target the upcoming wave of Honeycomb tablets will need to create variations of their apps for the different device types. Add in the BlackBerry PlayBook, HP’s TouchPad and the future devices from Nokia and Microsoft, and it’s not difficult for even a large development team to become overwhelmed. Appcelerator’s Titanium platform was designed from the offset to help web developers create mobile and tablet applications with ease. Over the last year, the platform has seen tremendous growth, and new features and devices are added at a fast pace. Appcelerator recently acquired Aptana, which should ensure that the tools for building its apps continue to improve and evolve over time. Some of the apps that have been built with Appcelerator include GetGlue for iPhone, iPad and Android and ScoutMob’s excellent iPhone app. In essence, it enables mobile developers to create an app just as if they were targeting the mobile browser but with the benefit of being able to get into the App Store. PhoneGap Build is a new service (still in beta) that lets developers quickly and easily create app-store ready versions of their apps for various platforms. It does all the work of compiling the code for various platforms and gives the developer a final build suitable for submission to the app market of their choice. Ars Technica used PhoneGap to build its iPad app. This is a great example of using web standards to deliver an app that presents existing content in a customized view and experience. Clint Ecker’s post about how the app was built is worth a read. Using various mobile web frameworks alongside an HTML5 platform is a common approach to mobile app development. Developer Pete Freitag recently gave a presentation on building mobile apps using jQuery Mobile and PhoneGap. Freitag made the slides available on his website and the presentation offers a nice overview of how to use two emerging web frameworks together. Feitag’s tracking and reimbursement app Mileage Pad was built using PhoneGap and jQuery Mobile. Other web frameworks that can be used alongside PhoneGap or Rhodes include Sencha Touch and SproutCore. Of course, an increasingly viable option for mobile developers is to just use HTML5 to create a mobile web app. As HTML5 gets better and browser support of HTML5 improves, the differences between running an HTML5 app in a native wrapper, a la PhoneGap, and accessing an HTML5 web app from an app shortcut on your home screen is going to continue to disappear. Lots of companies — including Facebook — are looking at HTML5 as the future platform for their apps that target next generation devices. Earlier this month, 37signals decided to forego building a platform-specific mobile app for its Basecamp product and instead created Basecamp Mobile. This decision initially drew some criticism, with members of the developer community questioning the company’s decision to just use HTML5. Whether it’s through a framework, via an application wrapper or as the basis for a mobile web app, HTML5 is going to continue to be an important driving force for mobile application development. In fact, as the technology evolves, we wouldn’t be surprised to see more HTML5 elements popping up in native desktop applications as well. Are you using HTML5 when building mobile apps? Let us know.